It is a place of swords and spears, revolvers and automatic weapons, sorcery and science, catapults and cannon, bows and arrows, computers and demons. It is a place where there is no Hope for the damned, merely the suggestion of it. Welcome to Hell, where Perdition rules. Whether a soul believes in Hell or not, Hell believes in damnation of the mortal soul. Anyone can end up in Hell, no matter what religion, no matter what faith. You may not believe in Hell, but Hell believes in you. In Hell, all things are possible. In Hell, many of the damned believe they have been wrongly sent there, while others accept their fate and try to make the best of a bad situation. In Hell’s Mortuary, the Undertaker giveth and taketh away, revives and reassigns the damned — again and again — so they can continue their dance with the Devil. 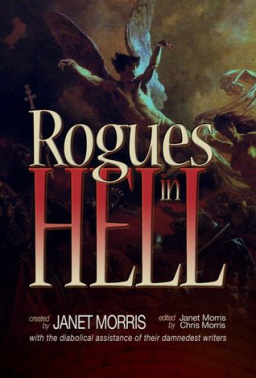 Yes, welcome to Hell — where rogues and heroes and fools quest for a way out, and Satan plots to storm the Gates of Heaven. Ah, but wait… the powers that be in Heaven have decided that Hell has become too comfortable. Infernity is in trouble. El Diablo is lying down on the job. Heaven has sent Erra, Babylonian god of plague and mayhem, and his 7 Sibitti (his Auditors, his Enforcers, his personified weapons), to further punish the innocent as well as the guilty, and they do so with great glee. They are Hell’s judge, jury, and executioners. Satan can’t even run Hell the way he wants to run it. Paradise mocks him. Will Erra replace Satan? Make things worse for everyone in all levels and versions of Hell — past, present and future? Dreamers in Hell is the 14th volume in this best-selling series, which has seen stories nominated and winning Hugo and Nebula awards. It is also the most ambitious book to date in this highly successful and most brilliant shared-universe of all. So let’s get started, shall we? Chris Morris gets things off to a grand start with Fools in Hell. Satan plans a great festival to celebrate the rebuilding and reopening of the Hellexandrian Library. (Guy Fawkes, in an earlier tale, had destroyed the Library, as well as the Hall of Injustice in his attempt to assassinate Satan.) Shakespeare and Christopher Marlowe write a play for Satan, who enlists their aid in yet another of his nefarious schemes. And who knows what wicked games, what sinister machinations lurk in the mind of His Satanic Majesty, aka HSM? “Leave me in hell then! But leave my hell alone!” Satan screams to “Above,” in Janet Morris’ wonderful Alms for Oblivion. There is too much overcrowding in Hell for Satan’s liking. So he sets into motion plans to prove that Humankind is unworthy of Hell or redemption, and deserves only oblivion. 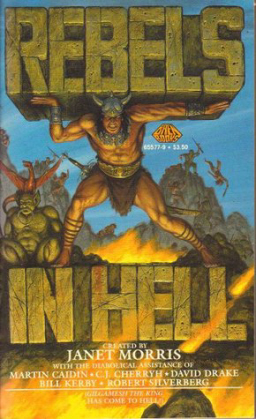 Rid Hell of Humankind, and the Netherworlds won’t be plagued by Erra and his 7 Auditors from Above running amok throughout Satan’s rightful domain. In Nancy Asire’s clever little The Unholy Hole, Caesar’s magnificent villa is totally destroyed, leaving but a massive hole in the ground upon which it stood. No survivors can be found. Are the dastardly Erra and his 7 Auditors behind this attack? Or is it someone or something else? Napoleon and Wellington are recalled to active duty by El Diablo himself. Attila the Hun and Sulla’s “legions” join them. Countess Marie Walewska, who chose to spend eternity in Hell to be with Napoleon, arms herself and joins in the fun. Next is Sara M. Harvey’s lovely and sad, Barefoot, On Brimstone. Isadora Duncan awakens from a dream of dance-performance, green grass, and her children — only to find that she is alone, still in Hell, and the infamous scarf that had strangled her is still around her neck. But then she meets Pharzuph and Naamah, a pair of fallen angels. It seems she has been summoned to Sin Francisco, to see Joshua Abraham Norton, who had once declared himself Emperor of the United States and Protector of Mexico, and they are to be her escorts. But what she asks of him only one personage can give, and so she must go dance for the Prince of Darkness. Shakespeare’s Ophelia, delicate and moody little flower that she is, finds herself once again in the hands of the Undertaker, in Shebat Legion’s wicked little vignette, Ophie and the Undertaker.Having twice attempted suicide, poor Ophie refuses to accept her fate in Hell and the fact that there is no escape. No matter how much the Undertaker takes from her, tenacious and stubborn Ophelia always finds herself crawling—or squirming—back to him. In John Manning’s delicious Just Desserts, Jimmy Hoffa is union president of all Hell’s damned souls. Satan has ordered him to provide labor for the reopening of the Hellexandrian Library. Infamous Nazis Heinrich Himmler and Joseph Mengele, with a few friends, are hired as cooks under the supervision of Jewish gangster, Izzy Bernstein. Meanwhile, Matthew Hopkins thinks he’s found a way for him and fellow witchfinder John Stearne to get out of Hell and escape to Heaven, where they belong. Needless to say, everyone gets what they deserve. Hell, I Must Be Going, is Michael A. Ventrella’s comedy-skit ode to the Marx Brothers, wherein Rufus T. Firefly and Ciccolini Ravelli, his assistant, are in charge of keeping track of all assignments in Hell. Enter one Margaret Dunwoody, who has come to question who they reallyare and what they are doing. Seems they’ve conned their way into positions where they can search for a missing brother who, for obvious reasons — is not in Hell. Hail, hail, Helldonia, land of the Knave and Unfree. INFERNAL NOTICE: Weapons are not allowed at the grand reopening of the Hellexandrian Library. In Head Games, Bill Snider’s sly look at psychoanalysis in Hell, Fionn mac Cumhaill, accompanied by his friend Caliban, leaves his sentient spear Areadbhar at the door. Then, during an interview with Sigmund Freud, the spear begins talking to Fionn, though only Fionn can hear it. Old Siggy finds Fionn’s attachment to the spear quite “telling,” and begins to explain how the weapon is an extension of Fionn’s… well, I’m sure you can guess. Throw in the Staff of Merlin, which can talk to the Fionn’s spear, a guest appearance by Merlin himself, and one harridan named Sycorax, who is the mother of Caliban — and hellzapoppin! Next up is Tom Barczak’s heroic tragedy, Blood and Ash. Beowulf is still in the process of accepting his death when he encounters Boudica, Queen of the Iceni. Then they meet up with Joan of Arc, who has come to lead them out of Hell. All three are sorely wounded and badly burned, as you might imagine. The trio meets up with former writer turned tinkerer, Charles Lutwidge Dodgson, who gives Joan a Vorpal Blade that he calls ‘Alice.’ Before they can escape down the rabbit hole, along comes Erra and his 7 Sibitti Auditors. The unexpected happens, a sacrifice is made, and we discover that even in Hell, there is such a thing as Hope. Hellexandria the Great is next at bat. Sarah Hulcy hits a home run as she tells us of Demetrius, the Chief Librarian, Makalani his assistant, and Caesarion and Brutus, the sons of Julius Caesar. Brutus and Caesarion are drafted as volunteers to act as guides for the guests at the upcoming gala in honor of the reopening of the Hall of Injustice and the Hellexandrian Library. During the boys’ training period, they hear of the destruction of their Dad’s villa by suspects unknown, and everyone is naturally on edge. (Could that all be part of Satan’s grand scheme to storm the gates of Heaven? At this point—anything is possible!) But everyone survives the big party, even though the witchfinders attempt to assassinate His Satanic Majesty. David L. Burkhead’s The Knife-Edged Bridge is a tale of friendship and loyalty. It stars William Simpson, veteran of Second Manassas, Jim Bridger, scout and trapper, and Perseus, Son of Zeus. In olden times, this bridge was known as the Bridge to Paradise. But now… who knows where it leads? For them, it will hopefully lead out of Hell. But along the way, Bridger is horribly mangled and tortured, and Perseus goes missing. Setting out to rescue his mates, Simpson finds himself in a disturbing level of Hell he’s never seen before, where his friends are being tortured by demons, rather than having been sent back to the Undertaker for reassignment. Simpson rescues his friends, as well as Archimedes, who claims he should be in Hades or Tartaros, but not in Hell. So they all set out to find Erra and his 7 Auditors, hoping to get Archimedes’s punishment amended—and fearing that they might make it worse. Our next item on the menu is Deborah Koren’s The Wager. It’s an interesting mash-up of the western and boxing genres, with a dash of Damon Runyon thrown in for seasoning. It stars Bat Masterson, the eternal gambler, and Wyatt Earp, who has become the manager of a boxer named Big Ed. Enter one Grayson, an atheist and former writer who refuses to accept that he’s dead and in Hell. Earp bets Masterson that he can’t convince Grayson that he is indeed dead and damned. As for what’s at stake, you’ll just have to read the story and find out for yourselves. Bettina S. Meister’s More Light is a very poignant, complex, and introspective yarn. Certain passages read like the inner monologue of poet and sorcerer, Johann Wolfgang von Goethe, who believes he has been wrongly sent to Hell. He suffers the daily humiliation of a poet’s soul. His sufferings of old age are daily presences in his life in Hell. He is tormented by memories of his mother, his wife, and his children. But even in the Realm of the Damned, one can find a friend, and he does — Karl Wilhelm Jerusalem, whose suicidal death Goethe had immortalized in his novel, “The Sorrows of Young Werther.” Arrogantly thinking that he can play with the powers of Hell, Goethe sets out to plead his case in hope of gaining salvation. In the Shadow of Paradise is Jason Cordova’s excellent, first-person account of Juan Ponce de Leon y Figueroa’s common-sense approach to survival in Hell, set in Lost Angeles. The 7 Sibitti have destroyed Hellywood, and through a landscape of death and devastation, Figueroa travels to find a map showing the way out of Hell, using the waters of the Fountain of Youth underneath the Mortuary. And then he meets Marie Antoinette, who has somehow acquired the map. With her is her attendant, Henrietta, who is in possession of box that contains a Prophecy Head Doll that speaks with the voice of Rasputin. Meanwhile, two Angels from Above discuss whether or not there is such a thing as ultimate salvation, and whether or not even the damned can be redeemed. Zero Sum Game is Richard Groller’s sci-fi seasoned take on what happens when Nikolai Tesla realizes what has been missing from his theoretical constructs. Tesla is Director of Infernal Research Projects. George Washington Goethals, once Chief Engineer in charge of building the Panama Canal, is Tesla’s assistant and ally. Thomas Edison is the comptroller of the Dept. of Infernal Energy. And Hero of Alexandria is the arbiter of the War of the Currents that is still being waged by Tesla and Edison. Tesla needs funding and is obsessed with besting Edison. Goethals has a penchant for skirting regulations. During the course of Tesla’s experiments, a worker demon is killed, and then a stress wave in the fabric of Space and Time causes one-third of New Hell to disappear. Could Thomas Edison be the saboteur? Tune in and find out! 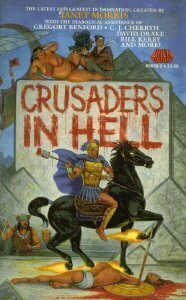 “All of Hell is a stage and the damned are merely players in Satan’s endless and infernal game.” So says Jack William Finley in his philosophical And the Truth Shall Set You Free, which stars Constantine the Great, one-time emperor of the Holy Roman Empire. Constantine can’t come to terms with the reality of his new existence in Hell, but he has a plan: “In the land of the Prince of Lies he would weave a greater lie than all that came before, a lie that would set them all free.” He assembles the finest minds in Hell, including Kierkegaard, Voltaire, and Schrodinger, to help him concoct this magnificent lie. Satan then orders gangster Frank Nitti to team up with Jack the Ripper, and they are sent to keep an eye on this intellectual rabble. When in Rome, do as the Romans. But when in Hell, do not attempt to emulate the Devil. The next entry is Michael H. Hanson’s The ITTT (pronounced eye-triple-tea) — The Institute of Terrified and Tortured Technicians. Sergei Korolev, former father of the Soviet Space Program and now, in Hell, President-Elect of The ITTT, is the keynote speaker at an upcoming conference, which revolves around the ongoing feud between Edison and Tesla. Edison is a crafty bureaucrat who lords it over the various infernal-internal technology departs, and steals every idea he can get his hands on. Also in this clever little tale, we see more of the irony and punishments of Hell: genetic engineers are plagued with physical deformities, and chemical engineers are constantly sprayed in their faces by all manner of toxic elements, for example. But what’s really at stake here is Tesla’s new space tunnel, Hell’s own escape hatch. Petra E. Jorns continues the tragic tale of Siegfried and Kriemhild in her mythic Siegfried’s Blade.Kriemhild awakens in Hell, suffering the pain of loss and guilt. Wandering over a field of bones, she hears a skull speak to her in a familiar voice. “You have murdered us.” It is the voice of Gunther, her brother, who had plotted Siegfried’s death with Hagen. Kriemhild sets out to find Siegfried, only to encounter Brunhild, her enemy, whose own vanity had led to Siegfried’s death, and they accuse and blame each other for that. Further along, Kriemhild meets Hagen, who now carries Balmung, Siegfried’s accursed sword. Hagen: whom she had allowed to murder her brother Gunther, and thus quench her thirst for vengeance. Haunted by memories of Siegfried, confronted by old ghosts and tortured by her own guilt, Kriemhild stumbles on, over the bodies of her brothers and all those she had brought to death thru her vengeance — and ultimately discovers the truth of her personal and private Hell. Stairway to Heaven is Ed McKeown’s wonderful tale of Emile Du Chatelet — physician, mathematician, and author—who seeks audience with Belial, Crown Prince of Hell. One-third of New Hell City has disappeared, and its citizens have not reappeared at the Undertaker’s for reassignment. According to Emile, Tesla could not control his Dirac Power Source — which is actually the underlying principle that binds the Universe together. She proposes a great mechanism by which they can rip open the dimension of Hell and march out to freedom — perhaps to Heaven itself. Emile, who claims she has done nothing to warrant her place in Hell, wants revolution. She wants to invade Heaven and face God in battle, but she needs Tesla’s help, and he’s still locked inside the Fortress of Despair — J. Edgar Hoover’s prison. Belial agrees to support her, and with the aid of a female demon named Smoke, the cowboy Frank Hopkins, and Achilles piloting a Blackhawk helicopter, they storm the prison in a battle worthy of a James Bond flick. Emile’s speech to the damned is thought-provoking, eloquent, and perfectly logical. What she asks of Belial, however, is a thing heretofore unknown in Hell. 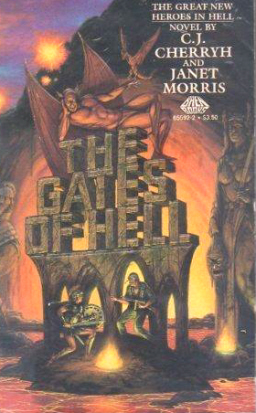 Knocking On Heaven’s Gates is Larry Atchley’s excellent and epic novella, starring Anton LaVey, founder of the Church of Satan on Earth. Seems he’s been blown to pieces in the failed attempt to steal from Guy Fawkes the Spear of Longinus, aka the Spear of Destiny—the spear that had pierced Christ’s side. LaVey wakes up in the Mortuary after experiencing a dream of light at the end of the tunnel, a heavenly dream of love and joy. Now he wants to experience those feelings again, if he can. After the Undertaker reconstitutes his body, LaVey sets out to file his report with Satan. Meanwhile, Tesla’s latest invention has backfired and a third of New Hell has gone missing. Hell now really looks like a painting by Bosch or Brueghel. LaVey realizes that Hell is truly going to Hell in a hand basket. Cut to Guy Fawkes, who was captured and is now in prison, but still in possession of the Spear of Destiny. But the Spear is embedded in his body, a result of an explosion during the failed attempt to take it away from him, and legend has it that whoever has the Spear is invincible and invulnerable. So no one can take it away from him. Enter Emile du Chatelet, who comes to free him and enlist his aid in her plot to storm the Gates of Heaven. Will her plan succeed or is it doomed to failure? And what is Satan’s purpose for secretly supporting but not taking part in the storming of Heaven’s pearly gates? Meanwhile, Satan wants LaVey to play keyboards and entertain the army of damned souls about to attack Heaven. But LaVey is suffering from Post-Traumatic Death Disorder and does not feel he can perform at his best until he recovers from his emotional trauma and his troubling dream. Just as self-serving in Hell as he was in life, LaVey wonders if he can become a better person, to be loved and to find redemption. After his first session with Williams James, Psychologist, Spiritualist, and Pragmatist, the big day has come for LaVey. He is ordered by demons to play the new and improved Liszt pipe organ while the army of the damned assaults the Gates of Heaven and battles a host of Angels. 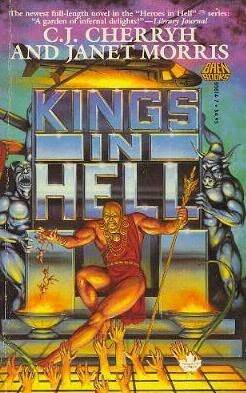 Ah, but things in Hell are not always what one thinks they might be, and LaVey realizes that everything in Hell has its price — even playing the pipe organ, to which he and a number of other lost souls are physically attached. Now we come to the final chapter, folks, and a most fitting pay-off it is, too. 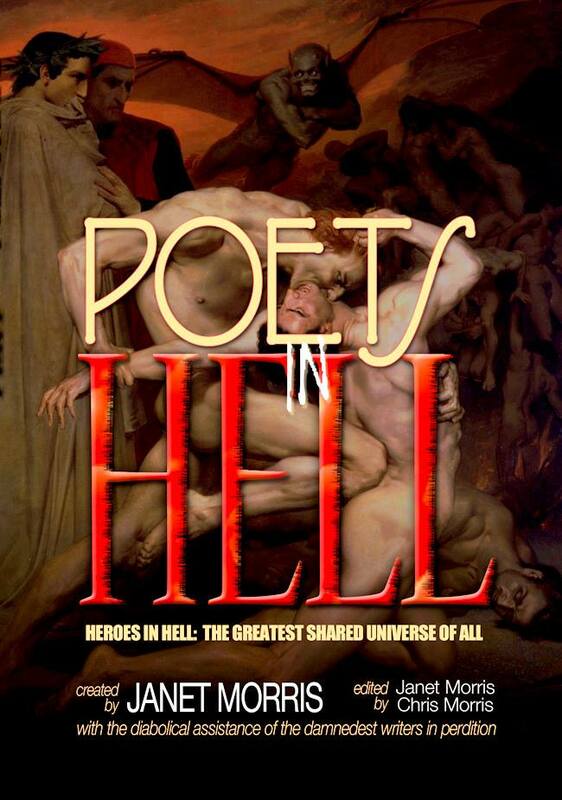 Janet Morris returns us to Chris Marlowe and Will Shakespeare as they perform, perhaps for all eternity, their play, Hell Bent, which is also the title of this eloquent and theatrical comic-tragedy. The two playwrights play lovers in a hellish parody of their own plays, which they have written to order, per His Satanic Majesty’s Request. Will plays the male lead, Marlowe the female. In every performance, Marlowe must kill Shakespeare — I mean, really kill him. But the Bard does not return to the Undertaker for reassignment, for Satan is there at every performance, there to revive him, once a night and twice on Sadderday. More than a parody, their play is almost a travesty, being made up of scenes and dialogue cannibalized from the plays they wrote in life. Marlowe, in love with Shakespeare, wonders and worries over the Bard’s infatuation with HSM. “Why should you love him whom the world hates so?” Marlowe’s character asks. “Because he loves me more than all the world,” Will’s character replies. “Hell is just a frame of mind,” Shakespeare replies through gritted teeth. That line from Faustus was Marlowe’s downfall — a line that ultimately proved to be false. He had taunted the Devil in life with it, and now he pays in Hell forever. Over and over again, Marlowe must kill Shakespeare in the final act, only to watch, through jealous eyes and suffering heart, as Satan brings Will back from the dead, showering him with love and favor. However, after long and many arguments, Marlowe convinces Will to trade roles with him, and the Bard in turn convinces Satan to let them do it, because he wishes to learn how it feels to truly kill a man. “Since I cannot prove a lover, I am determined to prove a villain,” Will tells the Devil, quoting a line from his own Richard III. Will the Prince of Darkness bring Marlowe back to life after Shakespeare kills him in the final act of their play? Ah, there’s the rub. Not since Adam and Eve has the Devil had such a pair to play, one against the other. In Hell, the Devil rules, the Devil is not mocked, and the Devil always gets his due. 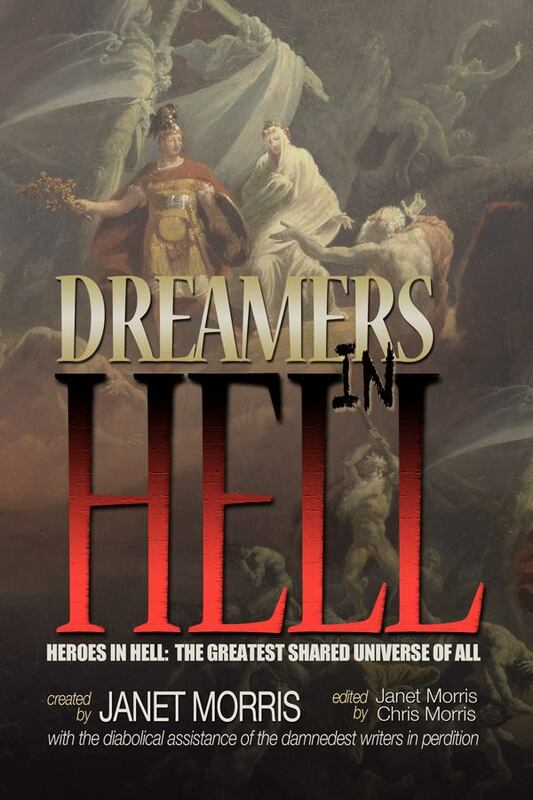 Each story in Dreamers in Hell is top notch. Perhaps I should say each chapter, for this is truly a shared-universe that reads like a novel, rather than an anthology. The stories are all very good, many are great, some are superb. This is a true collaboration of diverse hands that has been shaped and molded into a cohesive whole by Janet and Chris Morris. 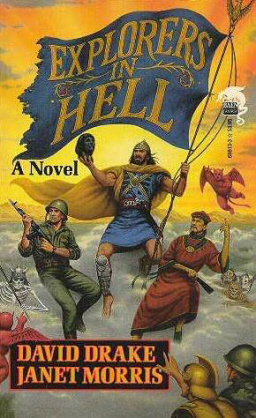 The beauty of the Heroes in Hell series is that all genres work in Hell, and no genre has been left undone. You’ll find horror and science fiction here, fantasy and historical drama, satire and action/adventure thrillers — even romance. These metaphysical, visionary “mythical epics” are character-driven, thoughtful, intelligent, and insightful. They examine the nature of Man, and the nature of good and evil. These are fables and morality tales, examinations into what makes Mankind tick, a look into the soul of humanity. Justice rules in Hell, too, you’ll discover. So does irony: all that was fair on Earth has turned foul in Hell. But all’s fair in Hell when it comes to how the damned are treated, of course. Yet for all its torments and punishment and betrayals and violence, there is friendship and loyalty to be found in Hell, courage and honor, and even love. And above all, Hope persists. For even in Hell, the damned can and do hope for redemption and salvation. Have some sympathy for the Devil and give Satan his due: check this one out. 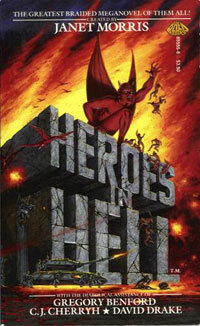 In fact, I recommend you check out all 14 books in the Heroes in Hell series. Just in case you find yourself in Hell one day, it’s best to be on the good side of the Devil. If he has one, that is.